The word “carol” comes from the Greek word horaulein, meaning a circle dance performed to flute music. In the Middle Ages, the English combined circle dances with singing and called them carols. Later, the word carol came to mean a song in which a religious topic is treated in a style that is familiar or festive. From Italy, where a strong tradition of popular Christmas songs in the native language developed under the influence of Francis of Asissi, it passed to France and Germany, and later to England. Music in itself soon became one of the greatest tributes to Christmas, and Christmas music includes some of the noblest compositions of the great musicians. Despite this long history, almost all surviving Christmas carols date only from the nineteenth century onwards, with the exception of some traditional songs such as “God Rest You Merry, Gentlemen”, “Good King Wenceslas” and “The Holly and the Ivy”. Traditionally, carols have often been based on medieval chord patterns, and it is this that gives them their uniquely characteristic musical sound. 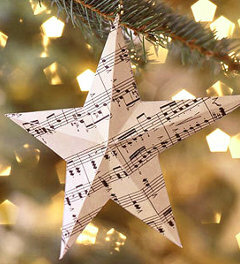 Most of the following Christmas tunes include some kind of accompaniment (Flute & Piano, Flute & Guitar, etc. ), but will sound just fine if you want to play them as solos.